The New York Times speculated on Monday that newly sworn-in Supreme Court Justice Neil Gorsuch might be rude to female justices based on his gender and ideology. The Times' Supreme Court correspondent Adam Liptak wrote that Gorsuch is "by all accounts the soul of courtesy, and he may have a hard time elbowing his way into the judicial crossfire that is the modern Supreme Court argument." Despite Gorsuch's courtesy, Liptak argues that two factors indicated that he would frequently interrupt his female colleagues. 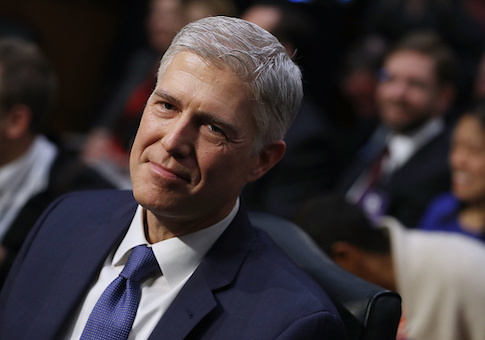 "A new study suggests that Justice Gorsuch has two things going for him: He is conservative, and he is male," Liptak writes. Liptak is referencing a study by Northwestern University law professor Tonja Jacobi, which found that conservative justices were generally more likely to interrupt their liberal peers during oral arguments. In addition, male lawyers were more likely to interrupt the female justices. "If we know going in that [Gorsuch]’s a conservative male, then we would think there’s a good chance that he would be an interrupter," Jacobi told the Times. Jacobi compared Gorsuch to Chief Justice John Roberts, who is also considered soft-spoken and courteous. "Chief Justice Roberts is a very polite man. He seems to care about decorum. He cares about the reputation of the court. And he’s one of the biggest interrupters, interestingly," she argued. This entry was posted in Politics and tagged Neil Gorsuch, New York Times. Bookmark the permalink.